This project is part of a paid partnership with Lowe’s. Most homes (just ours?) have that awkward corner or space that just doesn’t seem to have much use, or don’t decorate well. 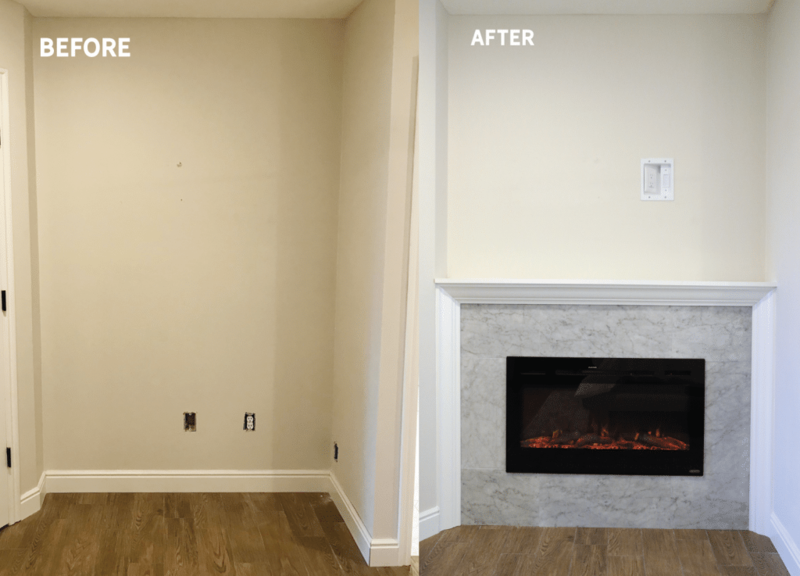 These areas often benefit most from custom, built-in elements, and with fall approaching fast, we decided to add a built-in electric fireplace to an awkward nook in our bedroom–and it’s something you can add just about anywhere, in a weekend. Not much use for this nook, except to hang a TV with wires dangling down the wall. 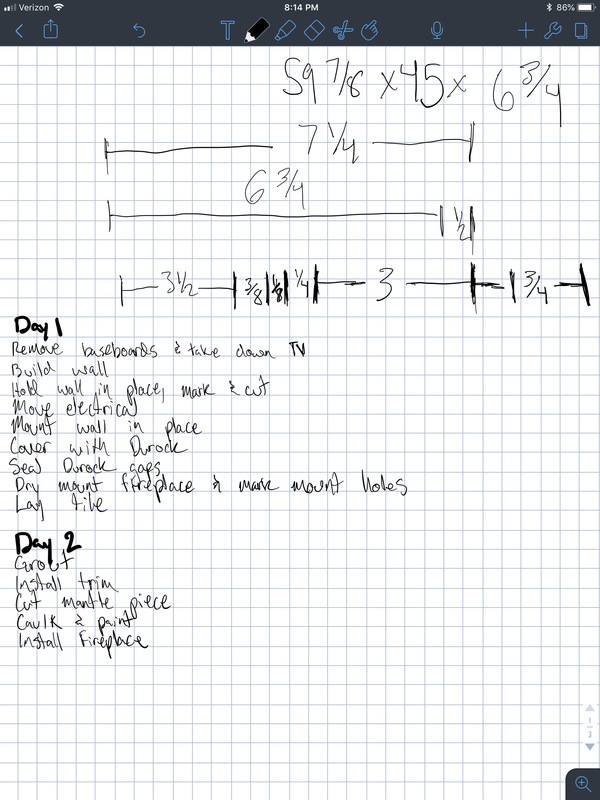 So our first step was to plan out what we wanted this space to look like. Jules shared some inspiration last week, and we learned what we could from the things we liked and applied them to our space. Here’s how we did it. The space we were working with was a hair short of 60in wide, and we could make the structure as tall as we wanted (up to 8ft, since that’s how tall our ceilings are). 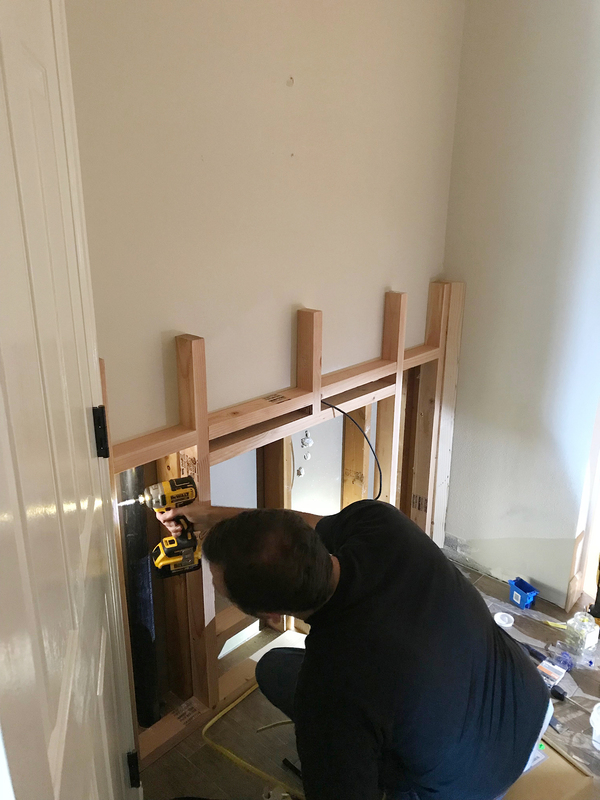 We planned to have the mantle 45in up from the floor when finished, so the frame was 5/8in shorter than that so once we added our top board, it would be an even 45. We opted for a thicker, 3/4 board, so it ended up actually being 45 1/8, but that’s negligible. The wall also wasn’t very deep, and since the doors into this bedroom swing inward, we couldn’t have the structure sticking out in the way. You can see at the top of the image above there is a depth diagram, where I was able to visualize each layer of the structure and how I was going to fit it all in. 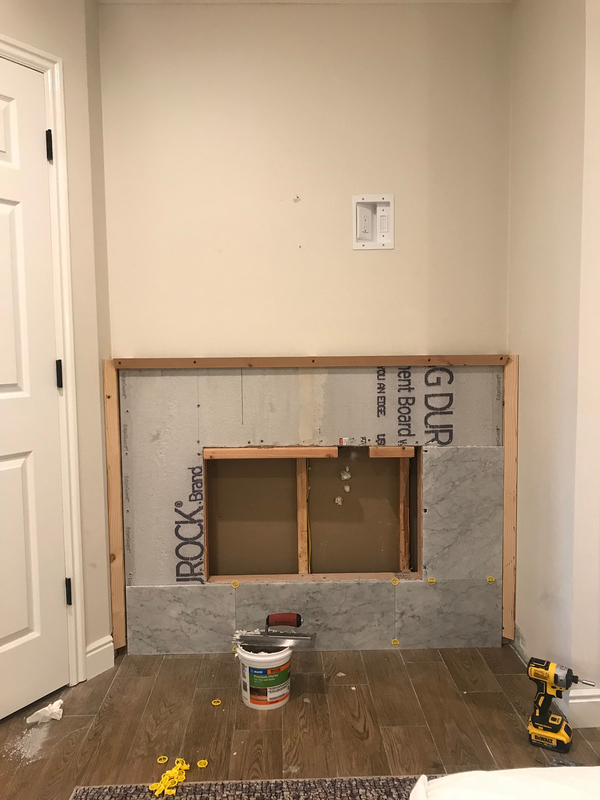 The wall was only 6 3/4 deep, but I needed extra thickness, so I planned to notch the structure out by 1/2 in on the back side of the top ten inches, then cut out the sheetrock below that. Then I also needed to notch out 1 3/4 inches from the studs in the wall, but only inside the fireplace area. 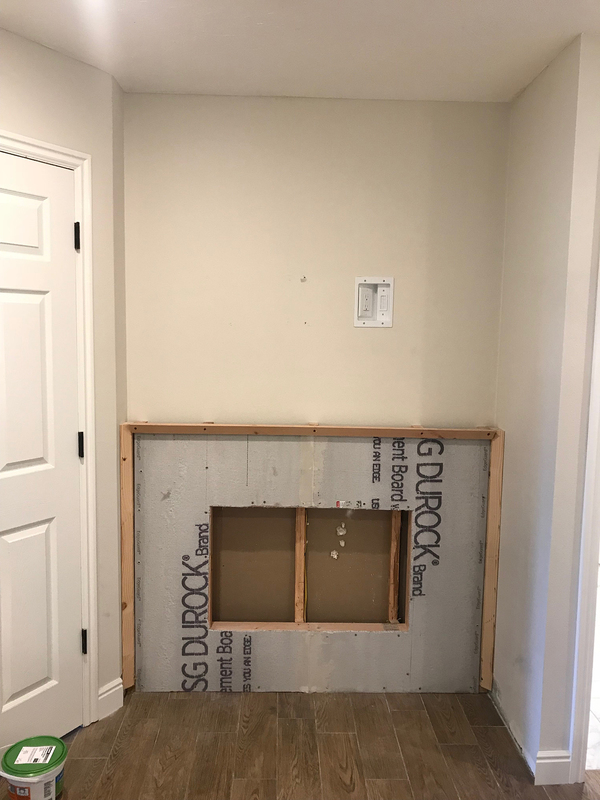 This would allow the fireplace (which is 5.5in thick) to sit back far enough, that our crown moulding (which was 3.5in tall installed) would have enough space. These are the details it’s important to think through as you plan. Every layer adds thickness, even the mortar behind the tile. Account for everything so there are no (or at least fewer) surprises. I don’t have a progress picture of building the wall, but you do want to build it first. 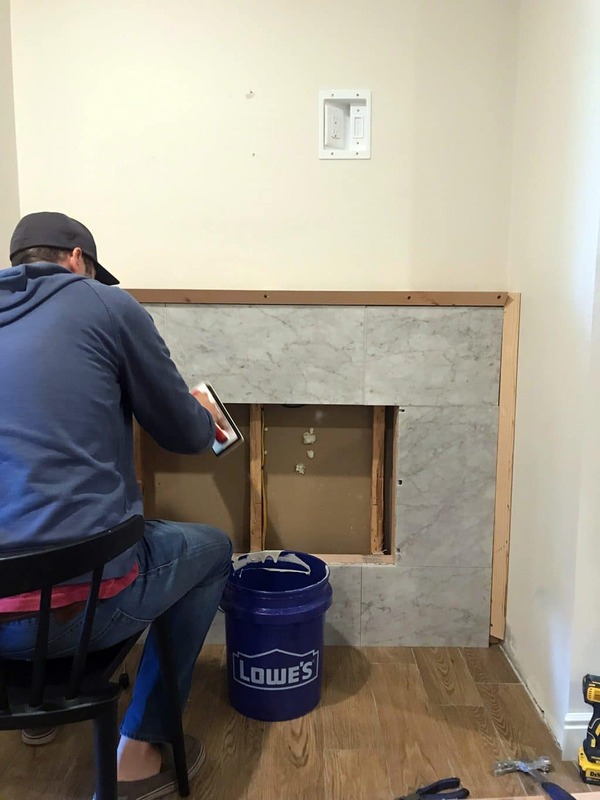 Then set it in place and use the wall to trace where you need to cut the sheetrock. Then cut. 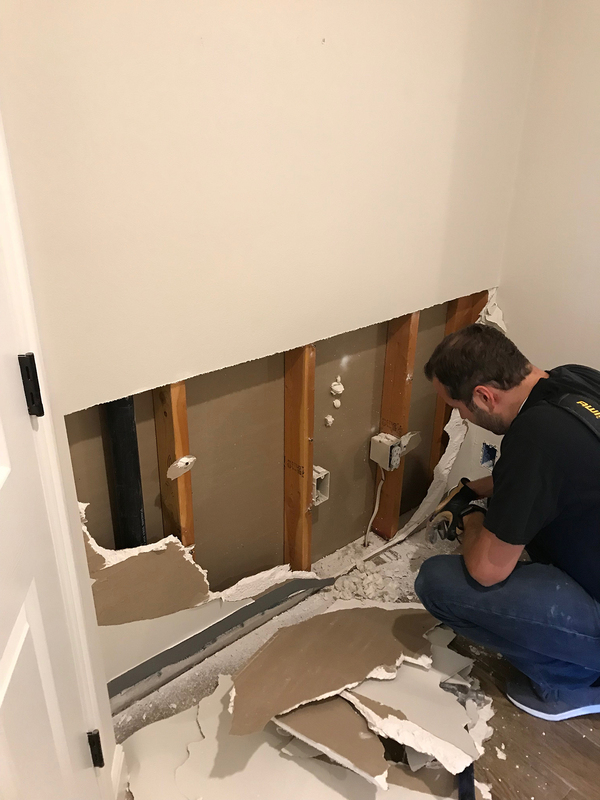 Of course, cutting the sheetrock is only necessary if you’re dealing with such a tight space, like we were. If you have the room to build the wall out further, then I would skip this part and just mount your wall in front of the regular wall. Important! – if you’re not familiar with running electrical, please hire a licensed electrician to do it for you. I shouldn’t have to say this, but working with electrical wiring can result in serious injury or worse. Don’t be a hero. 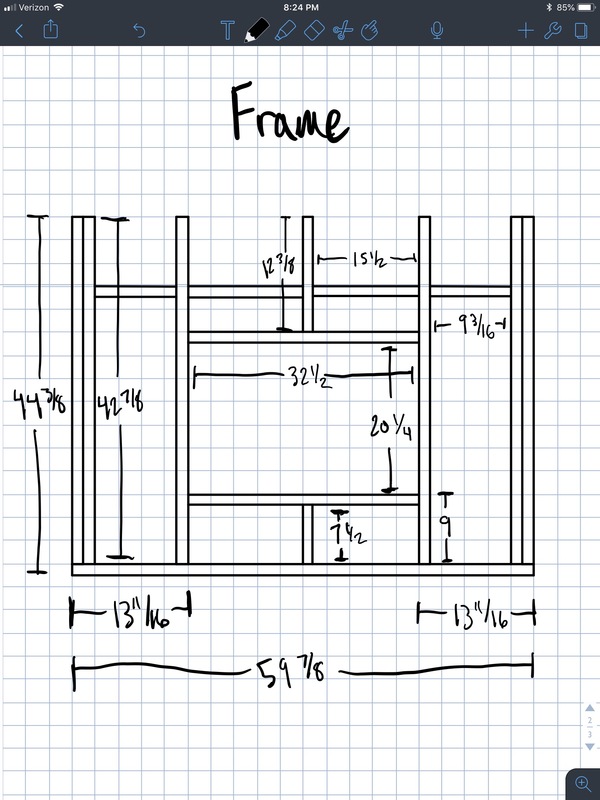 Once you’ve confirmed that the frame fits, secure it in place and begin running any electrical needed. 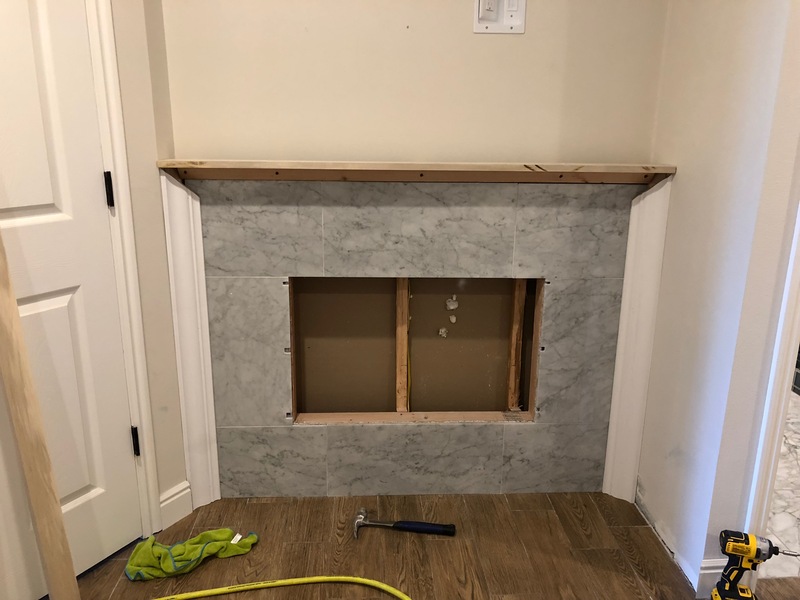 In the image above, you can see that I used a shallow outlet box and mounted it just under where the fireplace will sit, facing backward. This will allow the plug to be accessible after the fact (by removing the fireplace). 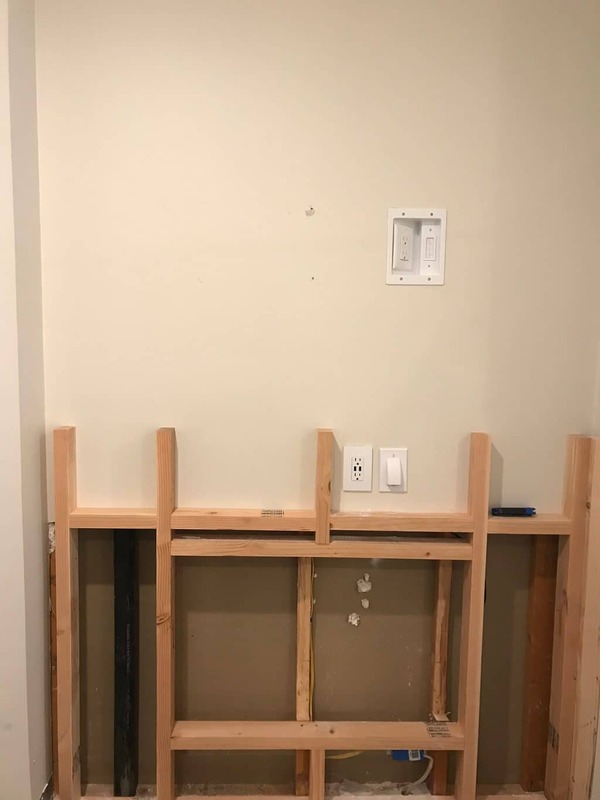 Note: in the image above you can see the top ten inches of the frame are notched so the 2x4s can sit flush against the wall where the sheetrock is taken out, and also flush against the drywall. We’re using the top section as hidden storage for TV components, so we wanted the drywall in tact. That part is optional. We also ran wire to an outlet in the wall for our hidden storage, with a recessed outlet above where the TV would sit. 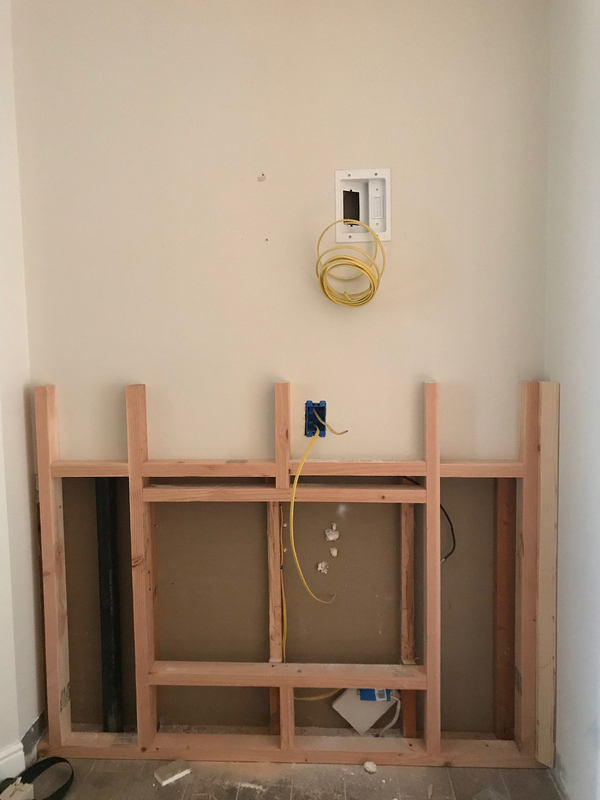 We had some open wall boxes on hand so we just used that for the lower section, but if I were to do it again I probably would have just used another recessed outlet box so there was one inside the fireplace mantle and one behind the TV. Live and learn. 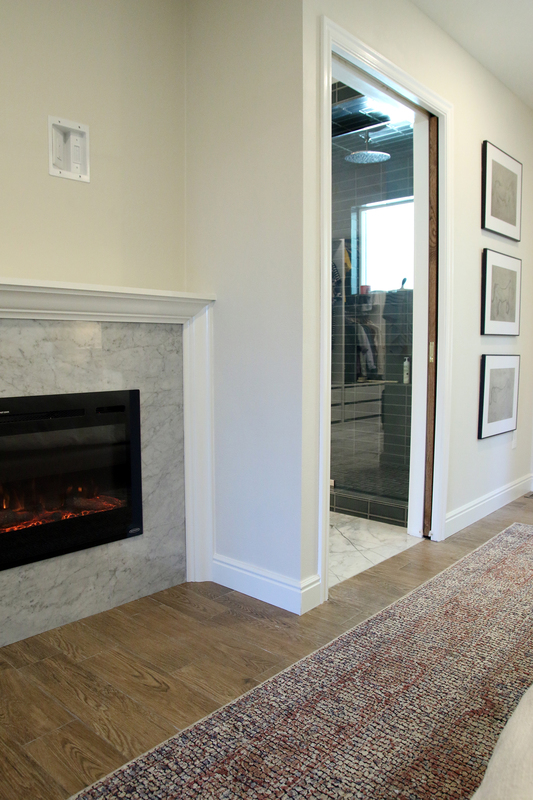 The Touchstone Inset Electric Fireplace is meant to used in the walls of your home. It’s safe to be right up against wood. So the Durock here isn’t for heat resistance, but for our tile. Durock is a bit porous and tile mortar adheres to it really well. You’ll also notice in the image above that I have angled, exposed boards on the sides and top. Those are our nailers for when we install the moulding around the finished fireplace. 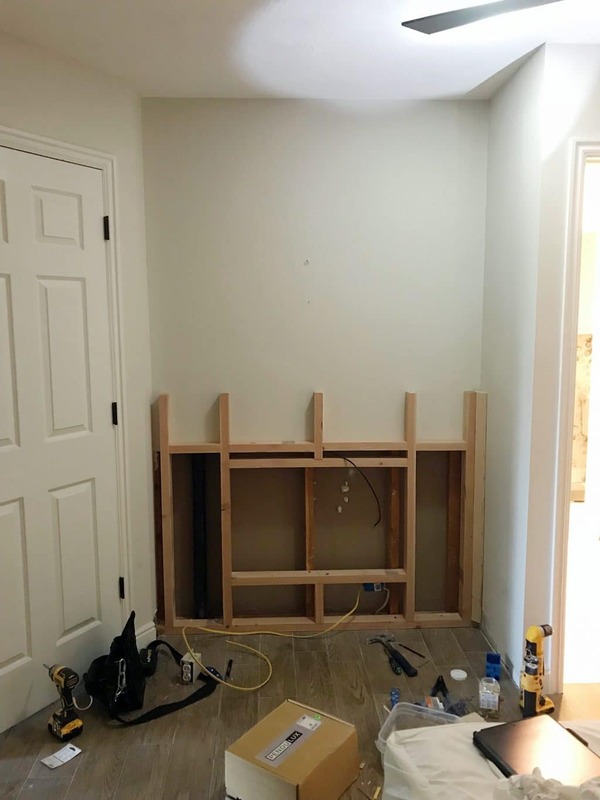 Without those, you’ll have a hard time getting anything to stick, so put those in place, screw them to the frame of the structure, and only tile up to them so you can nail the moulding directly into them. 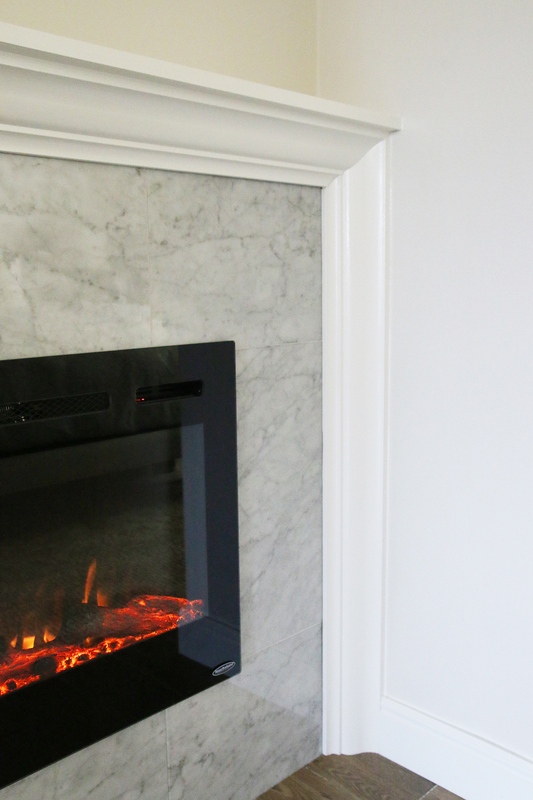 The dimensions of our electric fireplace worked out perfect on this wall. We used a 36″ Touchstone electric fireplace, but you can find larger ones at Lowe’s and if you have the space, I say go for that. Lay your tiles out beforehand and try to plan out where your grout lines will fall so there are no random lines here and there. 1/32 tile spacing is pretty tricky in large areas, but since this is such a small space, it works perfect and helps the tile look more seamless. 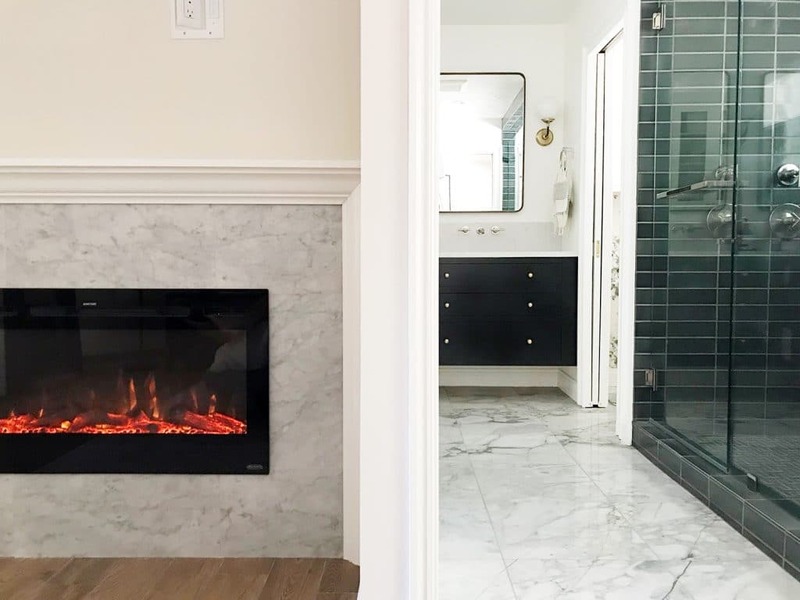 We were going for a marble slab look and used 12×24″ marble tile to achieve it. The tiles that we laid vertically going up either side, we looked for pieces that had horizontal veining to continue the look. Once the tile is laid and has set overnight, grout the gaps with a good quality, unsanded grout. Sanded grout is too grainy to fit in 1/32 spaces. We used the color Frost and it looked seamless. 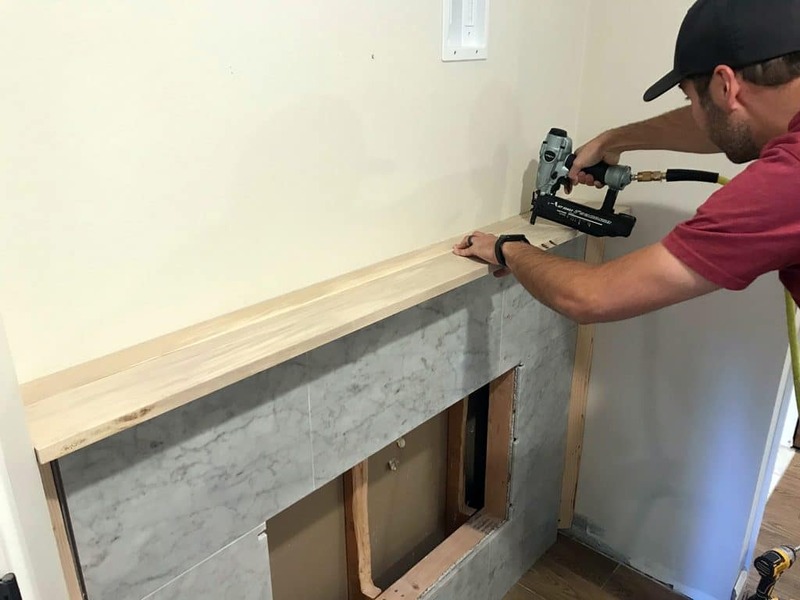 Using a brad nailer, attach your mantle piece first. It’s hard to tell in the image above but ours is actually two pieces – the front piece is nailed in place and the back piece is removable to access our hidden storage. Once the mantle is in place, you can attach the crown moulding to the sides and top. Brads also work well here, and this is when you’re going to be so glad you planned ahead and added the nailers. Caulking and painting can be tedious, but that crucial step makes the entire project. Once finished, go ahead and set your fireplace in and you’re done! Let’s see some glamour shots. Below is a short video of the fireplace in action, where we click through all the different settings it comes with (varied colors, degrees of brightness, etc.). It also has several heat settings, timers and can even be turned on without the heat element. Outside of the fireplace insert, materials for this project came in just over $500. In just three days (one day of planning, two of making it happen) we make this little space into something that makes our room feel so cozy, and even though we’re in no rush for winter, when it does arrive we’ll love this fireplace even more. I noticed that you made some little notches or cutouts on the sides of your tiles along the opening for the insert- if this so that you’re able to install the fireplace insert? I’m attempting the same project this weekend- just checking before I start tiling!! I am planning on installing the same fireplace and I was wondering if you ran a dedicated electrical line for it, or if it’s just on the same circuit as your tv? Yours looks amazing!! Same circuit as the TV. It doesn’t use a lot of power so it works fine. Love this!! Such a beautiful job. We’re wanting to do a similar fireplace in our living room. We currently only have one outlet that would be behind the fireplace, so would have to add one above for the mounted tv. Are your outlets on the same circuit? Trying to figure out if we need a dedicated circuit for the fireplace and wondered if you dealt with that issue? The electric fireplace doesn’t use a ton of power so it didn’t require a special kind of plug or its own circuit. 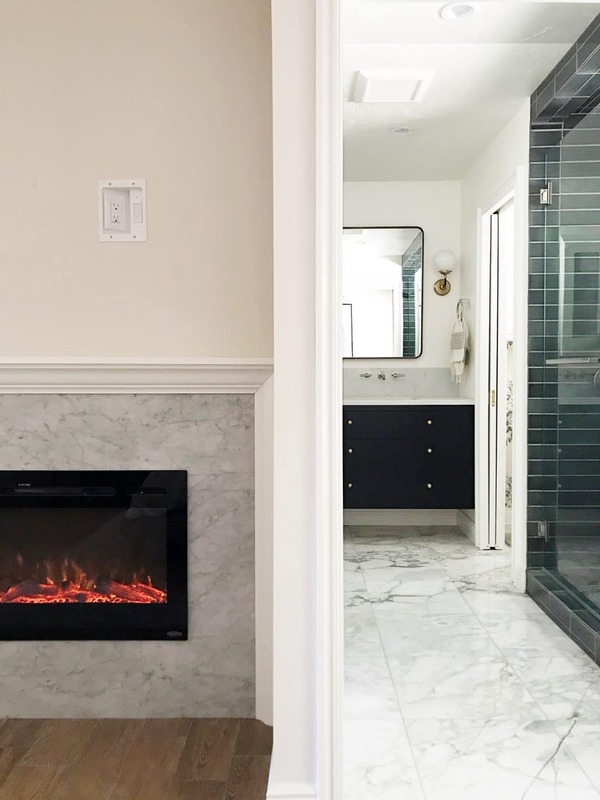 Love this … we’ve been planning to do an electric fireplace in our bedroom and family room … love the step by step pictures! It came out so nice! Hi! Your fireplace looks great! I clicked the link you used for it and it says it is 54″ It looks like yours was only 32″ Is there a different link for this exact fireplace? Thanks! Looks like the link changed and I’m not seeing it on the site. But the same one can be found on Amazon here. Thank-you so much for your help! I love your home and style! Great job guys! We’re doing a similar type fireplace wall in our great room & we’ve yet to install it because the fake fire look bothers me. Does yours have a crackling sound? No crackling sound on ours, but there are some that do. What is the trim color you use throughout your house? Thanks! We mostly use designer white, but I believe in choosing a trim color that corresponds with the paint color of the room. There’s no one size fits all. Oh my gosh, great job. Is your TV placed on that same wall? Thank you. Yes it is! An update on that soon! What about if you have carpet in your bedroom, would you need to create a hearth or is that just preference? It would be preference with this type of fireplace, as long as it’s at least 6″ off the ground. It makes me anxious that you never use a drop cloth. Ha! This looks great! I was wondering, is the fireplace hot to the touch? I was thinking if this is a concern with a toddler? If it is on, it will blow hot air. I’m so sorry! Here it is on YouTube! In your opinion would this only really work on an are like you had (a nook) or could you do this on any old wall? 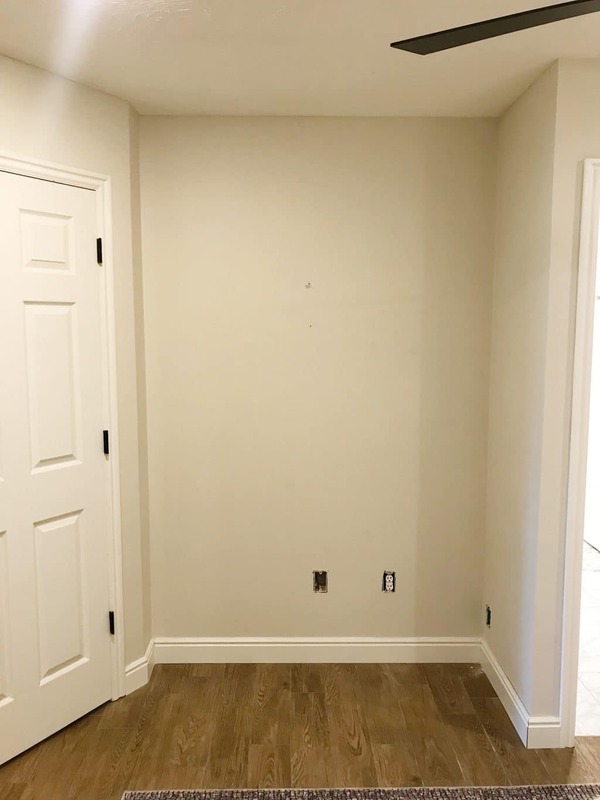 We just moved into a new house and the master bedroom is very large but hard to figure out layout. I’m thinking a fireplace might work well but don’t want it to look weird. Oh, it could absolutely work anywhere! You could go all out if you had more space. Is there a video in this post? I see references to it in the text, but everything seems to be just pictures in my browser. It’s directly above the full room shot near the end. There’s a play button over it. Do you see it? Does the door interfere? It looks great. Beautiful! It is perfect for that spot. Love it!!! Can you see it while lying in bed or must you be sitting up? You can mostly see it while laying, but sitting up gives the best view. I don’t understand the outlet that now appears to be hidden behind tile/under the mantle. What is the purpose of that outlet? I thought it is generally against code to cover up access to any outlet or junction box, or do you still have access somehow? And maybe I missed it, but is the fireplace hardwired or does it plug into that outlet facing backwards at the bottom? This was such a great use of that nook, well done! The mantle is cut into two pieces, and the back piece is removable for access to the outlets. 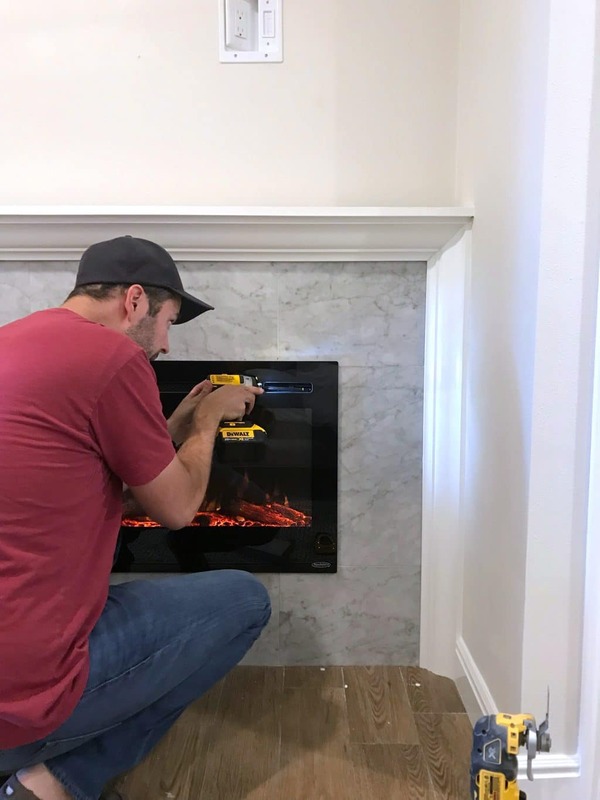 The fireplace is plugged into the outlet facing backward underneath, which is still accessible as well, since the fireplace is easily removable. Julia, this is so wonderfully done. Do you happen to have a photo looking down under the cap into the component section? Did you have more that one divice to plug in? Are you using some kind of repeater so the remote still works? I was watching your stories and you make it look so, so easy! Drool! Love the addition of the fireplace. Makes me want to put one in our bedroom even though we live in Texas! 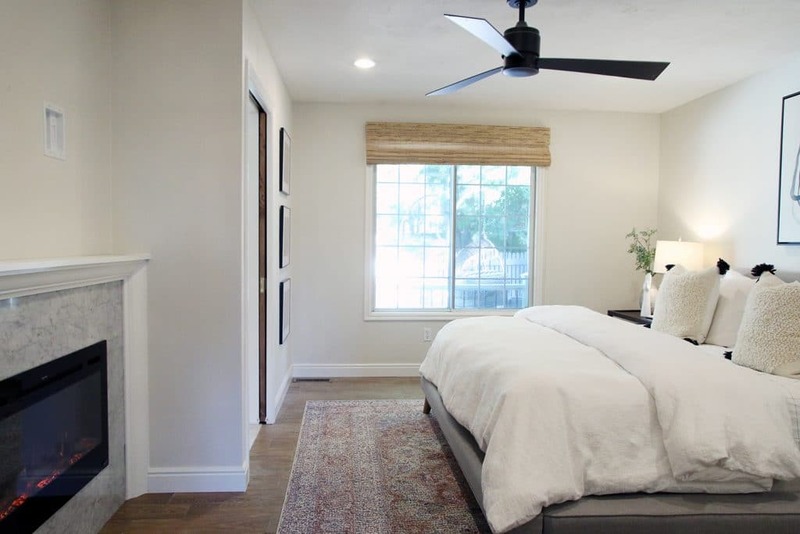 Your bedroom is a relaxing destination…one I would love to accomplish some day! Enjoy! I LOVE THIS PROJECT! Can’t wait to do this in my own home! Everything you touch turns to gold. It’s just gorgeous. We are working on planning a similar project as well and are considering this fireplace unit. Many of the online reviews spoke about how loud the unit was. What are your initial thoughts (having only had it a short period of time)? Assuming it wasn’t a deal breaker for you, obviously. But still curious now that you’re is installed and you’re using it. Thanks so so much! I’m trying to think what it’s comparable to. Our air purifier was WAY louder so is our bathroom fan–and that’s not even that loud. Not a deal breaker, for sure! You can hear it at the end of the video we included. Wow, the vibe of the whole space!!! So serene, peaceful and beautiful!!! Whoa! That was a quick idea-to-installation project. You guys are super good at coming up with beautiful ways to handle weird walls and niches that look intentional- I’m thinking of the black plank art wall I just read about in your 5 years of the living room post. My home DEFINITELY has a couple spots like that, and as I work on furnishing and arranging stuff I am keeping these great ideas in the back of my mind. 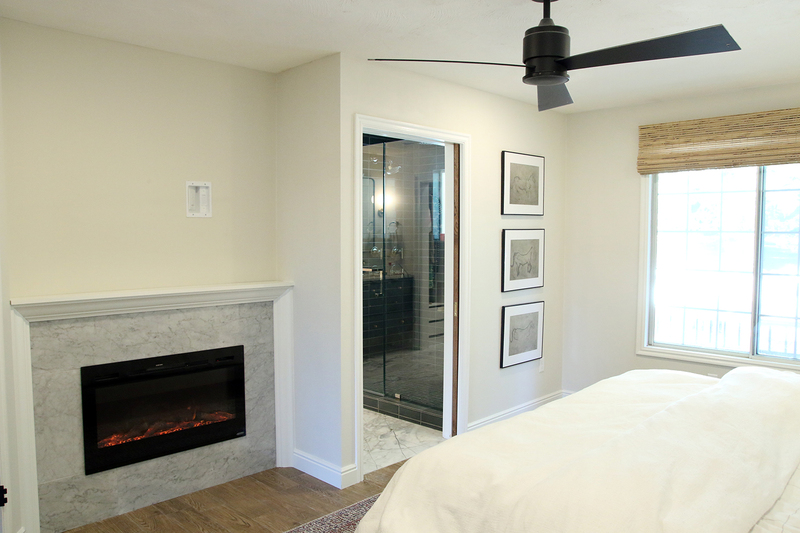 Also, the bedroom seems like a perfect place to have an electrical, mess free fireplace. I love using real materials and an electrical fire initially wants brings out my inner snob, yet we have a real wood burning fireplace in the living room by the side door and I love it, but can’t imagine dealing with bringing wood and cleaning ash in our bedroom at the other end of the house! This way you get the coziness and atmosphere while getting to be totally lazy. Win. Wow, this fireplace is EXACTLY what that corner of your bedroom needed! It looks like it was just meant to be there all along. Great job, guys! I have never commented before, but just wanted to say that I love your blog! You’re truly so inspiring. This looks really nice. I think it makes so much sense for your climate, your lifestyle and your daily happiness! It looks so good; like that nook was made for that fireplace all along. Fireplace and Chris are A M A Z I N G ! This is beautiful. It really adds to the room. I’d love to see how you access the hidden storage at the top. The fireplace really takes the whole space up a notch, which didn’t even seem possible because I already loved it! It’s the icing on the cake!